For restaurants, branching out can be a hard thing to do, particularly when it comes to maintaining the same quality. With seven branches already across Cairo, Maharaja has managed to do exactly that, as we found out at its newest venue at Tivoli Dome in Sheikh Zayed. With the same Indian-styled venue with aromas of spices and herbs that subtly teases you in, we took our seats in the orange-dominated venue – everything from the seats, to the bibs offered. We started with the Karak Roll (25LE), which were crispy chicken koftas stuffed with cheddar cheese. Despite the cheese not having enough of a zing to it, the chicken was flavourful with a slight spicy punch to it. Coming alongside it were three small cups each filled with a different condiment. The first was a mint-infused yogurt, which had a fresh, extinguishing effect to it. Pickled mangos were in the second, which had an extremely sour taste to it. Finally the third had some finely diced jalapenos which had a delightful sweet and spicy flavour. Up next were the breads, the Tikka Nan (20LE), the Cheese Nan (20LE) and the Plain Nan (10LE). Stuffed with finely cut chicken, the tikka nan had a nice crisp to it, with the well- seasoned chicken giving a nice subtle flavour to the bread. The same goes for the cheese nan, with tangy cheese replacing the chicken. 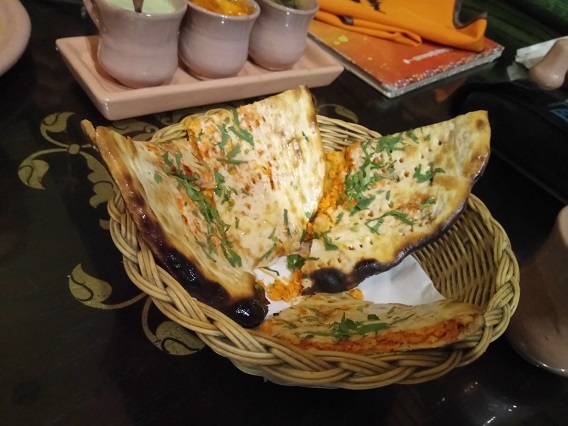 As for the plain nan, well it’s just bread, but after dipping it in our other appetizer, the Dal Maharaja (50 LE), it was a match made in heaven. The Dal Maharaja is black lintel cooked with butter in a tandoor oven. The lintels were in a smooth buttery sauce which had a rich taste – a perfect accompaniment for the nan. Our main dishes started to arrive with the Plain Biryani rice (25LE) arriving first and was served in a large vase-shaped pot and then poured onto our plates. With an assortment of seasoning already on it, the rice was bursting with aromas and we couldn’t wait to mix it with some sauces. The rest of the mains, including the Chicken Korma (55LE), Butter Chicken (55LE), Tandoori Chicken (60LE) and Akbari Gosht (60LE), came in small metal pots with four to five pieces of chicken or lamb included in each. The tandoori chicken came as different pieces of grilled chicken – on the bone – each of which had a nice orange hue and were bursting with a garlicky flavour and boasting a nice hint of ginger as an aftertaste. The Akbari Gosht, meanwhile, came as four cubes of lamb swimming in an aromatic, herbal sauce, but the cubes were slightly overcooked. 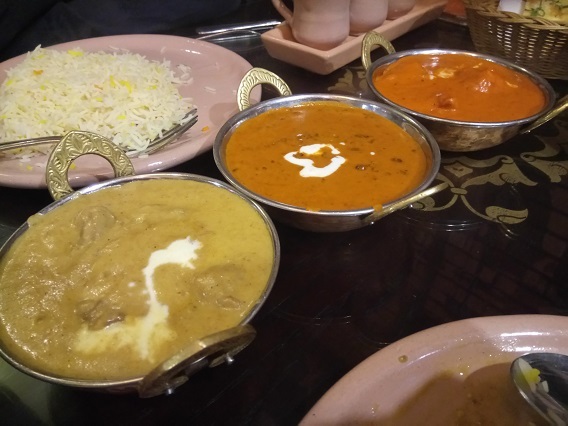 Our favourites, however, were the Chicken Korma and the Butter Chicken, both of which had five tender, boneless, perfectly-cooked chicken breasts. The korma is made with yoghurt sauce, brown onion and curry giving it a familiar Indian food flavour, while the butter chicken came in a rich and creamy tomato sauce that had the perfect balance of sweetness and acidity. Ten minutes later we ordered our dessert, with the Gulab Jamun (20LE) coming first as two small fried balls of freshly curdled milk, topped with shredded coconut and sugar syrup. Although they were soggy, it was still very much an enjoyable dish, thanks to its cheese-like flavour which made way for a sweet aftertaste with every bite. Next up were the Coconut Ice-Cream (25LE) and the Gajarka Halwa (20LE), the latter of which is a carrot pudding topped with nuts, raisins, shredded coconut and a cherry. 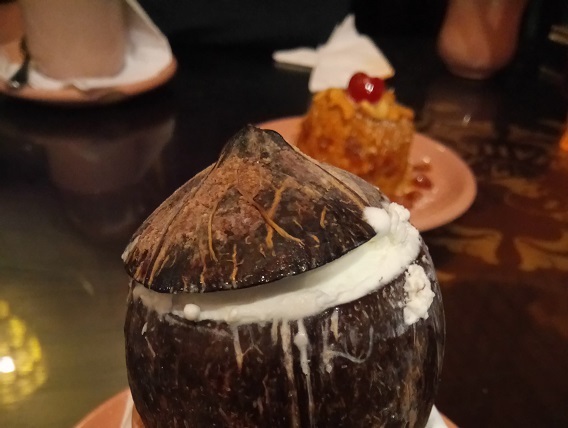 As for the coconut ice-cream it came in an actual coconut that was sliced at the top. We were advised to mix the pudding with the ice-cream, which we did, and it actually worked. The hot pudding melted the ice-cream, while balancing out the flavours and creating a smooth, rich, creamy ending to the meal. 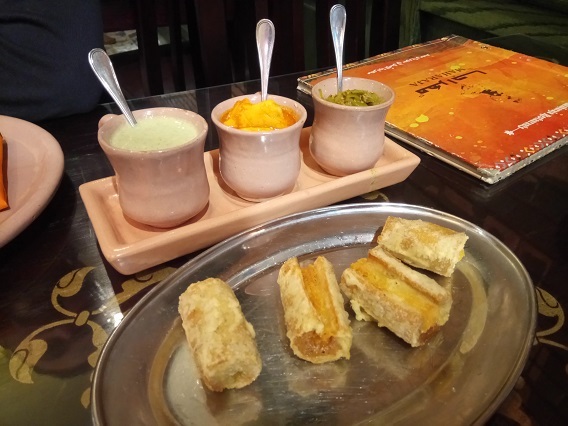 Though there are a decent amount of Indian restaurants in Cairo, Maharaja has become a staple over the years – and at the time of our visit, we could see why. But what has made the chain so enduring is the high-quality of the food and, most importantly, managing to retain that quality across all of its branches Cairo. There’s nothing out-of-the-ordinary or particularly unique about the menu, but what Maharaja does, it does it very, very well. Not so much a tip, but more of an interesting fact: Maharaja first opened as a chain in Syria in 2000, before its success brought it over here to Egypt. The Butter chicken and the coconut ice-cream were small pieces of heaven. The prices are a bit steep compared to the portions.